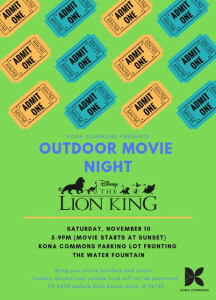 Kona Commons is launching an exciting new Monthly Movie Series on Saturday, November 10 from 5 – 9pm. Our first movie is Disney’s The Lion King! December 1, we will be featuring Sing! We hope to see everyone there!